I wash my hair in the morning before work and let it dry on the way in to work. If it's a dry morning, it's almost dry by the time I get in (about 2.5 hours from washing until I arrive at my desk), but if it's a wet morning, it can take longer than that. But, I like the feel of just-washed hair when I want to wear it down, so don't mind this routine. In the winter I might use a blower to dry my scalp before leaving, but since it's usually not that cold here and my hair is pretty much dry on my scalp before I leave, I rarely have to do that. I wash on Monday and Thursday mornings. Sometimes I will wash on the weekends if I want to wear it down for a date or special occasion, but normally it's just twice a week. Prior to some washings, I apply jojoba the night before. I saturate the length below my ears and leave it in overnight. Jojoba stays on my hair and doesn't get on my pillowcase at all, even when it's oily enough to look wet. I do a total washing (including the length) to get rid of the oil, and my length feels very "moisturized" and not the least bit dry. I tried CO (conditioner only) washing and didn't like it at all. Maybe my hair is too fine; don't know, but CO made it lank and dull. Apply conditioner and put on shower cap to keep conditioner in hair for around 5 minutes, then rinse. I usually let the shower water hit the shower cap to give myself a mini "heat treatment". *CWC = Condition/Wash/Condition. On long hair it is usually not necessary or even preferable to wash the length during most washings. So, with CWC you put conditioner on your ends or most of your length and keep them free of shampoo. Then wash your scalp and rinse. Martine, a long hair friend of mine, came up with this procedure years ago. *Vinegar Rinse: I keep a large plastic cup in my shower; it probably holds about a quart of water. I also keep a big tub of white vinegar in my shower. 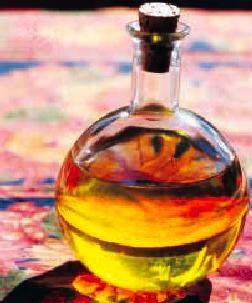 I usually add about 1/4 cup vinegar to the big cup of water and then pour over my hair. I do this every time I wash my hair. Towel Drying and Comb-Out: While in the shower and after the water has been turned off, I fold up my hair just enough to squeeze out the dripping water. I don't wring it. I then wrap my hair into a towel and get out of the shower. After about 5 minutes, I take off the towel, reverse it and put it back on (so that the dry part of the towel is where the wet part used to be). After about 5 more minutes (while doing other things) I take the towel off and spray my hair with Aubrey Organic's Primrose Tangle-Go Conditioner and then comb out with a wide-tooth seamless comb. 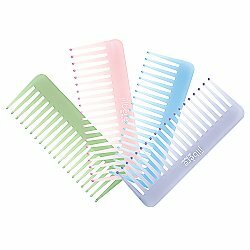 I use the comb pictured here that I get at Sally's Beauty Supply, It's a Jilbere de Paris brand, 6" long and inexpensive. My hair doesn't tangle a lot, but the detangling spray makes the comb really glide through. 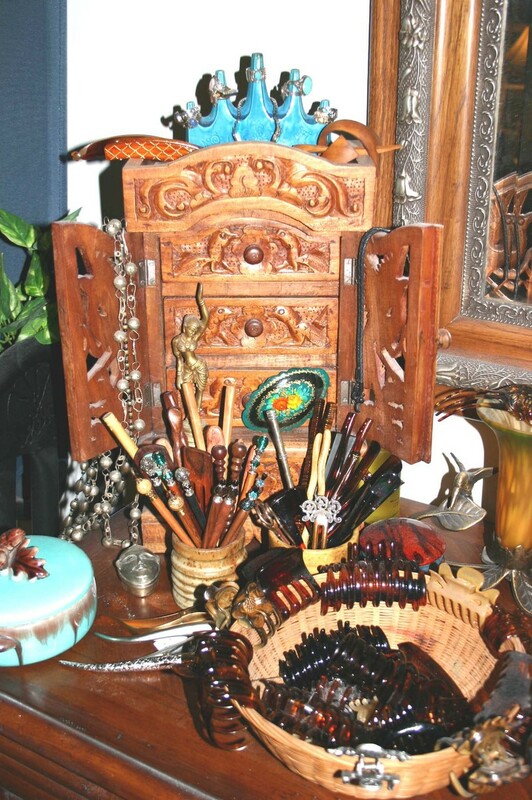 I have recently (2009) switched to Widu wooden combs and brushes and highly recommend them. They are much better for my hair and since using them I have less static electricity - and my hair just looks smoother. Plus they feel great on the scalp. Additional Leave-Ins: After I comb my hair out, I always add a bit (enough to barely coat both of my hands) of jojoba to the length. Then, when my hair is almost dry, I spritz the length with a mix I make that includes distilled water, aloe vera gel, vegetable glycerine, bergamot and grapefruit essential oils and jojoba. It makes my waves come out more and seems to calm down any frizzies. It is also wonderful on days I don't wash because it puts what waves I have back into my length each morning and takes away any "bed head" creases or bends. The Primrose Tangle-Go Conditioner, jojoba and my own mix are the only leave-ins I currently use. In the past I've used several different leave-ins that I liked in addition to the jojoba, depending on what I wanted to do with my hair. If I was going to plop and/or scrunch, I added Jessicurls Rockin' Ringlets or another product to help my waves form. With my longer length now I don't plop anymore since the waves don't form very well with the additional weight of my hair. 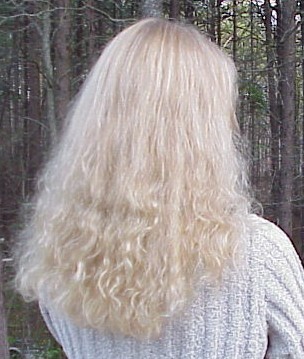 Regular Drying: After adding the leave-ins, I air dry. I don't comb or brush my hair while it's drying, though I might turn my head upside down and shake it around to get more air in between the hair to speed up the process (and give it more "oomph"). It usually takes my around around 3 hours to totally dry if I'm up and moving around. Plopping: I don't currently plop or use a hair dryer, but when my hair was shorter and I wanted more waves, I plopped and scrunched. After adding the products I liked, I plopped into a large aquis type towel I got from Lisa Janey, and left it up for 15 to 30 minutes if I was doing it in the morning before work, or longer if I had time. Once I took the towel down, I'd either air-dry or use my hair dryer turned to warm (never hot) with a diffuser. Usings the diffuser gave me nicer and more prominent waves, but I don't like using the dryer anymore. I used to do that for special occasions when my hair was shorter. Combing and Brushing: After air drying, I comb my hair with a wide tooth comb when it's completely dry. I occasionally use a brush during the day with plastic teeth that are placed far apart from each other and are soft and very flexible. If I wear my hair down, I will brush my hair every once in awhile, so I do brush, but probably use a comb 80% of the time. I use a BBB (boar bristle brush) when I oil my hair with jojoba the night before washing to make sure it's distributed all throughout my hair. I mainly use a brush right before taking a shower to stimulate my scalp and remove any loose hair - and for styling purposes. Other than that - the longer my hair gets - the more it seems to prefer being combed. Whole Foods 365 Shampoo for Dry and Normal Hair "Lavender Blend": This is my new favorite combination in 2009. It makes my hair do exactly what I want it to do, so how can I argue with that? Aubrey Organics Honeysuckle Rose: This was my favorite for a long time. I love the smell and how it makes my hair feel soft and look glossy. The shampoo lathers more than some of Aubrey's other shampoos and it's the only one in his line that works for my hair. The conditioner is so thick it's hard to get out of the bottle. Aveda Color Conserve: I use this to remove color when Mike colors my hair. But I don't like using it because of the phlathates that are in it. (I try to not use anything with synthetic fragrance in it anymore.) I use it once about every 6 weeks when I color my hair because I'm afraid the Honeysuckle Rose doesn't have the oomph to get all the color out. Aveda Sap Moss S&C (shampoo and conditioner) (still use occasionally and like a lot, just very expensive). This is recently been discontinued. I generally steer clear of SLS's but not because they irritate my hair or scalp. I just think the jury is out on their safety. And I don't have a problem with silicones and can take or leave them it seems. These days I don't use them. Heat Treatments: I used to do these once a month with different products, but haven't in a couple of years now. My hair seems fine without them now. 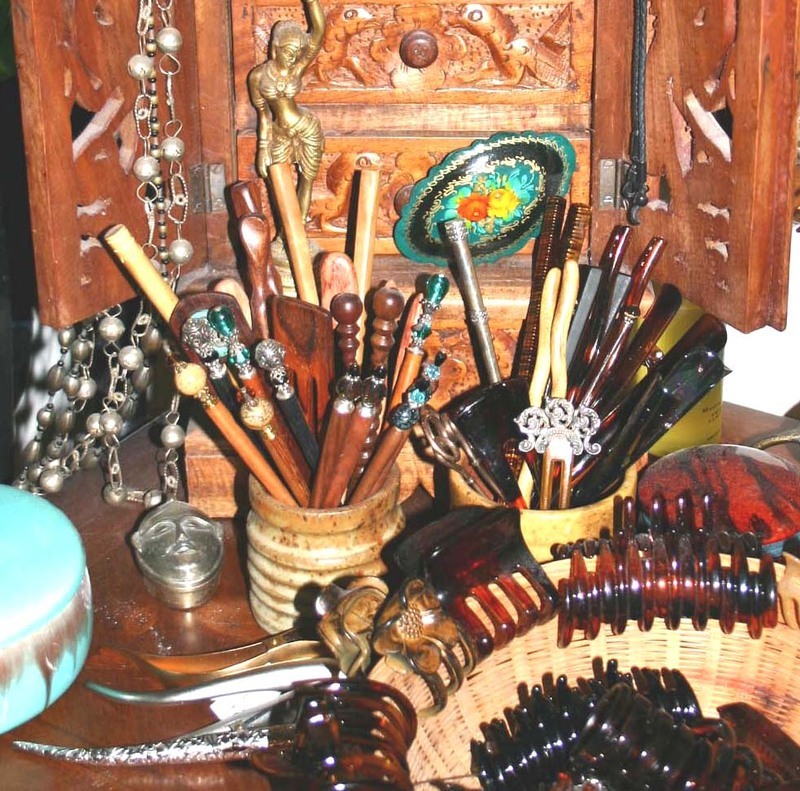 Hair Toys: I can't use metal barrettes. I used to use them for lots of half-updos, but discovered they were severing some of my hairs. I could see a line of shorter hairs where I wore them. I switched to all plastic barrettes, safe metal ones or hair slides - though a rarely wear barrettes for any reason these days. I prefer hair sticks, forks, Ficarres and some velvet scrunchies that match my hair color. Sleeping: I wear my hair down and sleep on a silk pillowcase. Since I have down pillows, it's like sleeping on a cloud. I think the silk also helps keep my face from looking all mushed up in the mornings! Growing Out My Perm: It's been asked how I dealt with growing out my nasty perm of years and years (see picture). The main thing I discovered first was using jojoba. Immediately my hair seemed to get more pliable and softer. The next major thing was washing less often. Until I found the hair boards back in 2000, I washed and blew my hair dry every single day. And I used industrial strength shampoo and no leave-ins. And I was perming and coloring! Once I started treating my hair better, it just slowly improved. But all the permed hair had to be cut eventually since it was so damaged. Some damage can not be repaired. I hated the half straight and half permed look and while it was growing out, I blew my hair dry when I washed my hair. Wished I hadn't - as I think that might have damaged the top layer (canopy) and took me longer to grow that damage out (and why I kept trimming back my hair). No more blow drying! All during my perm grow-out, I got trims to rid myself of the damage, slowly but surely. While I saw others on the boards letting their hair grow and grow, I had to constantly trim mine because it was so fried. I've always been one to prefer quality over quantity, but it was tough feeling as though I was getting nowhere. But now my perm is all gone; it took a good five years. It's so nice having my natural texture back after 23 years! I hope this "routine" is helpful in some way. I don't obsess about my hair and just try to do what works.